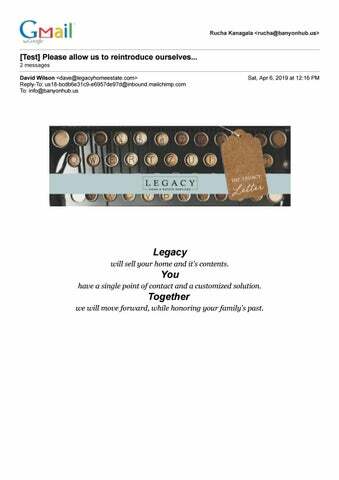 Legacy will sell your home and it's contents. You have a single point of contact and a customized solution. Together we will move forward, while honoring your family's past. Please allow us to reintroduce ourselves. Legacy Home & Estate Services was born of a sincere desire to help families navigate big and often stressful life changes and transitions. Downsizing, cleaning out, organizing, donating, selling property, staging a home, and selling a homeâ&#x20AC;&#x201D;each of these is a grand task on its own, but often families find themselves having to manage many of these projects all at once. In addition, sometimes these tasks become necessary when a family is grieving the loss of a loved one. We are the solution to this complex problem. Tell Us Your Legacy We are interested in your stories, and other people will be, too. People love to see a particular collection of items within the context of their unique home. How were these items displayed? Why were they loved? Every home has an important story to tell. We will help you tell that story, handling all the overwhelming details so that you can focus on honoring your family legacy. Each home has a story to tell. We want to share your story and legacy with the Louisville area. Legacy Real Estate We are fully licensed to sell your home. If you wish to sell your personal property with the home, we offer discounted percentages for bundled services. As a member of Mayer Realtors in Louisville, we provide listing, photography of the home, and all services involved with a typical home listing, such as inspections and appraisals. We can also provide modern services such as HDR photography and drone footage. If we are not selling your home, we will advertise your home and realtor at no charge. Here is a sneak peak at some of the homes we have coming up for sale. Personal Property Sales and Beyond We do one thing that most realtors won't do. We help liquidate the personal property. If you have improvements to the home needed, we will coordinate quotes for you from three or more sources and present them for you to select what meets your budget. If we run into problems, we solve them with you. We are in this together. 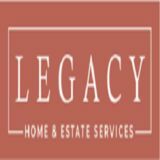 We are Legacy Home and Estate Services. We vow to help you move forward while honoring the past. Happy to help. Please call us at (502) 938-6327 or email us at contact@legacyhomeestate.com. How can we be of service? Copyright ÂŠ 2019 Legacy Home and Estate Services, LLC, All rights reserved.